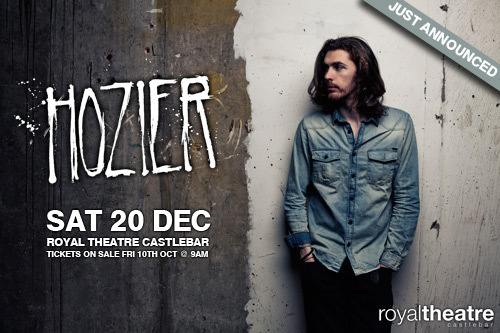 Castlebar - County Mayo - Chart Topper Hozier to Play Castlebar! Hozier has just announced, that he will play a very special date at The Royal Theatre, Castlebar on Sat 20th Dec. Support on the night will come form the fantastic Wyvern Lingo. Hozier’s debut album has smashed 2014’s Irish album sales records to become the fastest selling album of the year, and is currently at Number 1 for the second week. Following its release today in the UK, Hozier is currently sitting at #1 on iTunes UK and is Top 5 in Germany, Austria, Switzerland and New Zealand. The new single from the album, Angel of Small Death and the Codeine Scene, is available now and impacts in Ireland on November 28th. His single, Take Me To Church, is currently sitting at over 12 million views on YouTube and Hozier has now become one of Spotify’s most viral artists in their history with over 21 million streams of the single, and with six songs in Spotify US’ Viral Chart. Hozier is now back out on tour across America, where he will perform on Saturday Night Live this Saturday 11th October. Tickets Online: From Ticketmaster.ie on Friday 10th Oct @ 9am.